Bhikkhuni Hsien Du was born in 1960, and her ancestral home is from Huichang County Jianxi Province. In 1986 she was tonsured by Elder Bhikkhu Cheng Yi, and given the Dharma names Liao Xing and alias Si Qi. The Master graduated from the Graduate Institute of Huayen Buddhist College and subsequently earned a PhD in philosophy from the University of Delhi. She served as the 6th abbess of the Huayen Lotus Association. During Master's two terms as abbess, she promoted Dharma learnings in the practice groups and advocated for the charity work of Fu Tian Benevolence Association. 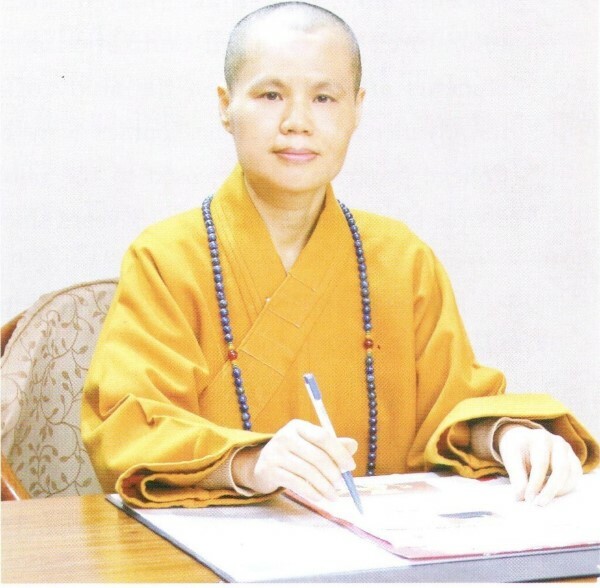 When she left her post as abbess, she was hired as Vice Chairperson of the Board for Huayen Lotus Association due to her great contributions to Dharma teachings, education, culture, and charity. In 2009, Master Hsien Du began to serve as the chair of the board for Huayen Lotus Association, the executive council member of the Taipei City Buddhist Association, the chair of the board for the Avatamsaka Buddhist Lotus Society, and the chair of the board for the Zhiguang High School of Commerce and Industry . Master Hsien Du va1ues education. During the 17 years after she took over the post as Director of Huayen Buddhist College and the Director of the Graduate Institute, she has taught Huayen Sutra to followers and students a1ike, as well as: "Huayen Studies", "Huayen Seminar", "Huayen Literature", and "Huayen Cultivation and Realization Commentary". The students are gvided from the study of the basic theory of Huayen to its advanced studies. The courses were also recorded an Open Buddhist College program and re1eased to the public. The "Huayen Sutra" seminar course has been running for 15 years since 200l. Between 2001 and 2011, in order to promote Huayen studies, the Master traveled as many as 57 times all around the world as the invited seminar speaker. In those days, information technology was less advanced, and the Master would carry her own computer and projectior for the seminars. The locations where she has given talks include: Jiansu Taizhou Guangxiao Temple, Taizhou Guangxiao Temple Buddhism Society, Hainan Guanyin Temple, Shanghai Jade Buddha Temple Buddhist Institute, Jianxi Jinshan Temple Buddhist Institute, Jiuhua Shan Buddhist Institute, Min Nan Buddhist Institute, Hangzhou Buddhist Institute, Yangzhou Fahai Temple, Suzhou Xiyuan Jiechuang Temple, Shandong Cham Shan Temple, Shanghai Jade Buddha Temple, Huazhan Temple, Jinan Shentong Temple, China Buddhist College, China Buddhist College Qixia Branch. The Research Institute of Buddhist Culture of China, Peking University Re1igion Department and Philosophy Department, Fudan University Philosophy Department, and Shandong University Philosophy Department, etc. Seminars were held in European or American locations, including: Ca1ifornia Avatamsaka Buddhist Lotus Society in USA, Bodhi Way Association in USA, Mahabodhi Society of USA, Chinese-American Mutua1 Assistance Association in USA, Time News True Fami1y Values of USA, Huayen Buddhist Sutra Seminar, Huayen Literature Seminar, Austria Vienna Buddhist Center, Hungary Buddhist Center, and San Jose City Council, etc. Huayen seminars were held in Southeast Asian locations, include: Vaidurya Buddhist Lodge at Bukit Mertajam in Penang, Malaysia Buddhist Institute, Singapore Buddhist Association, and Singapore Management University, etc. Master Hsien Du has studied Huayen Sutra and Huayen philosophy. She devoted her life to Huayen practices and focused on Samantabhadra practices, the visualization of the Dharma realm, and studied the Cundi Dharani Sutra daily. The Master stayed on top of information technology advancements and used multimedia course materials to teach Dharma learnings all over the world, The courses given included: "Ten Paramita", "Huayen Sutra with Commentary ", "Huayen Concept", "Huayen Buddhist Studies Practice", "Ten Bhumis ", "Ten Practices ", "Ten Degrees of Transference of Merits", "Ten Inexhaustible Treasuries", "Elevate to the Tushita Pa1ace", "Tusita Palace Praise Verses Collection", "Huayen Sutra with Commentary", "Huayen Practicer's View on Crisis in Society", "Huayen Sutra's View on Amount and Time", "Ten Concentrations", "Non-discriminating Cause/Effect Appearance of Buddha", "Enter the Dharma Realm", "Avatamsaka Alphabet", "Bhuddist Care for the Living", "Huayen Origins", "Huayen 39 Summary", "Compassion Altar Repentence Overview", "Development of the Huayen sect", "Inspiration from Hua-yen Sutra", "Huayen Sutra Summary", "Great Mercy Guanyin Practice", "Benefit All Sentient Beings Hea1ing Master Practice", "Huayen World View", "Huayen History Overview", and "Huayen Life Inspirations". Moreover, regarding the editing and conpilation of Sutras, the Master estab1ished the publishing department in 1996 to publish series of Huayen course materials and the Revision Commentary on series of Huayen Sutra, which was published in 20 volumes in 2005. In 2006, her book "Huayen Course Notes" (in simplified Chinese) was published by Mainland China's Religion Culture Publishing House, and is the assigned text book for relevant departments in Mainland China's universities. The Master realized that teaching in Chinese will limit the number of audience, which is why she hired specialists to translate "Huayen Sutra" into English, demonstrating a foresight rare among Taiwan's Buddhists. Master Hsien Du was devoted to three main tasks: promoting Dharma learnings, education, and charity. (1) Promoting Dharma learnings: Huayen Lotus Society is one of the few Taiwanese organizations have focused and promoted of Huayen. The practice groups are also characteristic of the society. Monk Nan Ting started the twice-a-month Huayen Chanting Ceremony in 1954. In 1957, the ceremonies were divided into spring and winter seasons by the first and second half of "Eighty Huayen", each 40 volumes, and the " Seven-Day Huayen Buddha Recitation Retreat" is held at the end of the year. For 60 years, Dharma education has gradually transformed from a traditional-base to a modernized method. The has gredvallg utilizing of more technology equipment and the experts empowered the group practices and Buddhist events to educate the public in the most effective way. Starting from 2012, an altar is installed for Huayen Seven Location Nine Occasion Ocean Seal Samdhi Dharma Ceremony in accordance with the ceremonial procedures, leading the followers to cultivate and contemplate according to The Repentance Procedure of the Vows of Bodhisattva Samantabhadra. The "Huayen Sutra" chants inspire deep thought on the truths of Dharma. The process uses a creative modern style to preserve the traditions. A. Multi-channel system for education advancement: The Graduate Institute began to receive "elective course students" in 2010, comprising of university students and general public. In 2013, a graduate diploma course was jointly givened incor incorporating with Huafan University. The cecation requires the completion of 12 credits from the assigned academic program and within four years, the graduates will receive a Masters degree recognized by the Ministry of Education. In 2010, the promotion department was established to receive the general public. In 2013, the community adult learning Buddhist and Creative Arts courses were started under the Taipei City Office's "Lifelong Learning Passport Project". In 2014, the International Huayen Research Center was established to promote academic studies. B. Digital teaching equipment : In the new digital age, Buddhist studies must incorporate new technology research and a digital teaching method. The Institute uses the latest audio-visual classrooms equipped with 1080p teaching equipment, and has a "Huayen Buddhist College Website", which allows instant public access to the current semester's courses and instructors, course materials, graduate thesis, seminar recordings, etc. In 2013, the Institute collaborated with Dharma Drum Institute Digital Archives to jointly hold digital courses, including the editing of e-books and Huayen archives. (3) Charity : Master Hsien Du has devoted herself to charity since she began to serve as abbess in 1994. Her endeavors includes: winter charities, caring for children and orphans, disaster relieves, etc. The services cover groups such as: elderly, children, orphans, poverty, emergency relief, student aid, etc. Regular charity events, such as Bodhisattva offering of ambrosia, are held jointly with the Lotus Society to serve those in need, in poverty, and in distress. They aim to salvage the world with Buddhist compassion in the spirit of Bodhisattva. The Institute has been awarded organization excellence awards for several years from both the Ministry of Interior and the Taipei City Government. “Huayen Course Materials ”,“ Turn of the Dharma Wheel Collection ” (I, II),“Buddhist System and Commentary ”,“Guanyin Practices ”,“Huayen Thoughts of Pure Land and Dharma Practices ”,“Huayen Seminar ”,“ 53 Stories of Sudhana Kumara ”,“Huayen Ten Bhèmis Brief Commentary ” (Ⅰ, II),“Huayen Sutra Lecture Notes (Ⅰ~ V) - Wondrous Adornments of World Rulers, Appearance of Buddha, Samantabhadra Concentratio, World Achievements, Huayen World, Vairocana, Names of the Buddha, Four Noble Truths, Awakening by Light, Bodhisattva Name Inquiry, Clean Practices, Wise Chief ”,“Zen Course Materials”, and“Development of the Huayen School During The Tang Dynasty ”, etc. Master Hsien Du Huayen Sutra Lectures DVD (I-XI) - Wondrous Adornments of World Rulers, Appearance of Buddha, Samantabhadra Concentration, World Achievements, Huayen World, Vairocana, Names of the Buddha, Four Noble Truths, Awakening by Light, Bodhisattva Name Inquiry, Clean Practices, Wise Chief, Buddha Ascent to the Peak of Mount Sumeru, Mount Sumeru Praise Verses, Virtue and Merit of Initial Motivation, Dharma Understandings, Ten Abidings, Fan Practices, Ascent to Yama Heavenly Palace, Yama Palace Praise Verses, Ten Practices, Ten Bhèmis (I) Happiness (II) Separation of Dirt. Huayen Origins DVD, Master Hsien Du Huayen Sutra Lectures DVD, Cundi Dharani Sutra Seminar DVD, Huayen and Samantabhadra DVD, Huayen World View DVD, Huayen Life Inspirations DVD, Avatamsaka Alphabet CD, etc. Copyright© 2010 Huayen Lotus Association. All rights reserved.